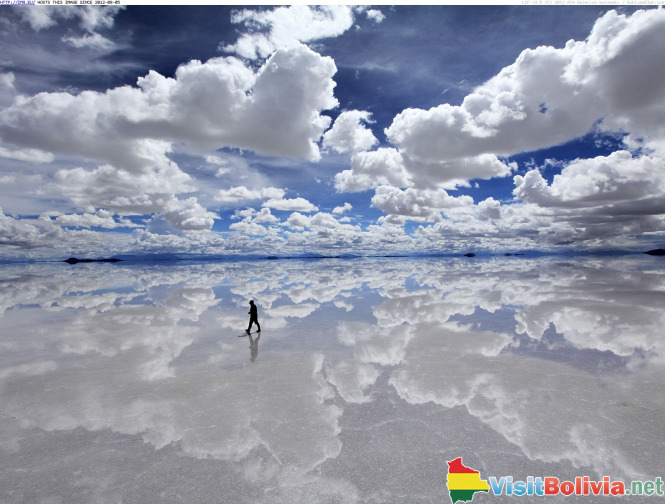 If you’re looking to see a different side of Bolivia, a visit to the unique Salar de Uyuni or salt flats will give you the ideal opportunity to see one of the most interesting places in the country. Salar de Uyuni or Salar de Tunupa covers an area of 10, 582 square kilometres and is the largest salt flat in the world. 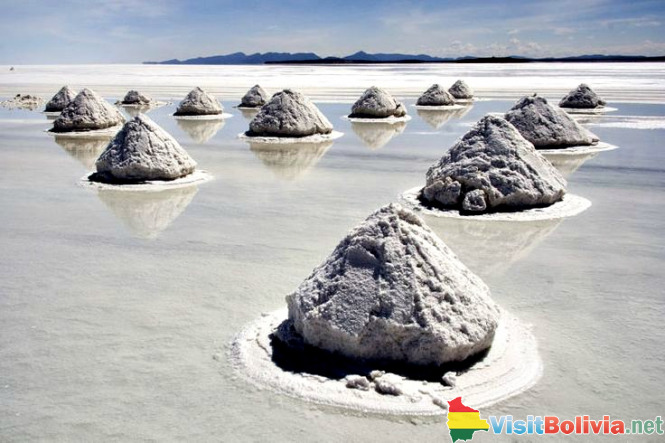 Located at over 3500 metres above sea level in the south western area of Bolivia, close to the crest of the Andes, the salt lakes are covered by a salt crust layered over a pool of brine which contains a very high concentration of lithium, amounting to over 50% of the world’s lithium reserves. Set amongst some of the harshest terrain in the country and overlooked by Bolivia’s Tunupu volcano, the salt flats are an incredible sight. While nobody knows the exact quantity of salt comprising the salt flats there are undoubtedly millions of tons of the glittering white crystals. Many companies now include tours of the salt flats in their itineraries, together with visits to unusual lakes coloured in shades of red and green and populated by flocks of pink flamingos, fields of steaming hot geysers and springs and barren volcanic landscapes dotted with ultra surreal rock formations. Set in an area which has a reputation of being fairly inhospitable, conditions during such trips are likely to be pretty uncomfortable but the reward of seeing this wonderful natural landscape will definitely be worth any inconvenience. Although trips to the Salar de Uyuni are becoming more and more popular, the general standard of facilities and services still remain relatively basic, and although most tours are conducted in 4 x 4 vehicles, the harsh terrain is often responsible for tour vehicles breaking down. For this reason visitors are advised to take extra warm clothes, a sleeping bag and some high calorie snacks in case they do get stranded along the way. While all this sounds pretty off putting, it should be remembered that the drivers and guides leading these trips are well versed in fixing vehicles so usually hold ups don’t last that long. Starting in Uyuni itself, the first stop on the tour is to the train cemetery which is a graveyard for decades old rusting trains. From here the tour makes its way to Colchani to see how the salt is processed before going on to the salt flats themselves. The first sight of the piles of salt is always breathtaking; acres of white glistening salt stretching as far as the eye can see over the largest salt desert in the world. You’ll get to see the ‘Ojos de Sal’ where salt water bubbles up through gaps in the salt crust and the mounds of salt which has been harvested and now lie waiting to be transported. 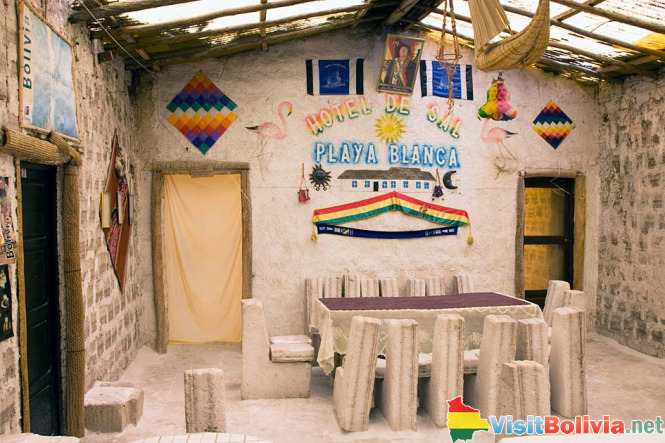 You’ll also get to the see the original salt hotel, made completely of salt but which now stands derelict and devoid of guests, before going on to visit Isla Incahuasi or Isla Pescado otherwise known as Fish Island and the home of some amazing giant cacti. From here you’ll be able to take in some spectacular views of the salt flats as they surround the island completely, so don’t forget to bring your camera to capture some of the incredible and awe inspiring scenery. The perfect reflections on the surface of the flats make it feel as though you could almost reach up to the sky and touch the clouds. Tours to the salt plains often incorporate a visit to the nearby mountains. Here you’ll find the amazing ‘arbol de piedra’ (tree of rock) which is reminiscent of a Dali sculpture and flocks of pretty pink flamingos standing one legged as they feed from the mineral rich waters of the tranquil lagoons. A visit to Laguna Colorada is also a must, to see its rich red coloured waters. You’ll also be treated to spectacular displays as geysers shoot steam into the air and send mud bubbles up from the earth. You’ll also get the chance, if you’re feeling brave enough, to ease your aching muscles in the warmth of the natural hot springs which abound in this area, before heading to the entrancing green coloured waters of Laguna Verde which sit under the shadows of the snow capped mountains behind. For less that $20 a day tourists can find a room for the night with families who live in the area in the villages of Atulcha, Villamar and San Juan. Often these homes are without electricity or running water but despite this lack of home comforts they welcome visitors with open arms, inviting them to share their frugal meals and sometimes even inviting them to join in the local activities such as llama shearing.